You’ve had a complex cavity in one troublesome tooth for longer than you’d like – so you finally went to your Zionsville dentist to have things taken care of, once and for all. Rather than having another filling, your dentist suggested a dental crown in Zionsville as the correct treatment method. But, after having your tooth prepared and the permanent crown placed, something is off. The crown doesn’t look right, and it definitely doesn’t match your existing teeth. So, rather than going back to the same dentist for the same disappointing quality, you visit the team at Trinity Dental who explain what good dental crown work should be. 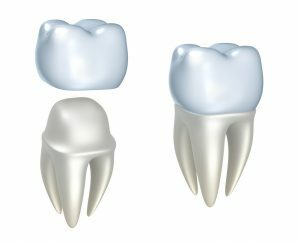 Before we get into the details about good or bad dental crown work, let’s define what a dental crown is: these are tooth-shaped “caps” that fit over your existing teeth or a dental implant. They are made of durable, biocompatible porcelain that blends right in with your natural smile. How Can I Tell If I Have A Good Dental Crown? Your dental crown will fit perfectly. It will match the surrounding teeth with the same shape and contour. It will look like it comes out of the gum tissue straight and naturally, like your other teeth. It will make proper contact with opposing teeth to give you a correct bite. It will match the color of your surrounding teeth. How Can I Tell If I Have A Sub-Par Dental Crown? Poor fit – which causes recurrent tooth decay and sensitivity. The crown will need to be replaced frequently and will fail quickly. Over-contoured crowns will cause inflammation around the tooth, gum disease, decay, and quick crown failure. The crown might look like a hat sitting on a hat rack, rather than a natural, secure fit. The crown is too tight between teeth, or doesn’t make correct contact with surrounding teeth, causing food impaction and decay issues. The crown might look like a marshmallow or corn kernel, rather than a tooth due to improper contouring. Most ill-fitting or improperly contoured crowns result from dentists or technicians who cut corners. In dentistry – like many other things in life – you get what you pay for, so we always recommend working with a qualified dentist like Dr. Julovich, and with a highly skilled technician who actually crafts the crown. Although you might spend a little more up front, you’ll save money with less frequent replacements, and you won’t have to deal with the emotional costs of a noticeable smile flaw. And don’t be embarrassed if you have a bad dental crown – even celebrities like LeAnn Rimes have had poor results that need to be corrected. Now that you know how to tell the difference between good and bad dental crown work, schedule your appointment with Trinity Dental to have the high-quality, great-looking results you deserve!